Hey guys! Aren't we all just majorly crushing on velvet right now? Be it bombers or party dresses..velvet is soo chic and absolutely perfect this time of the year, when it's a little breezy with just the right amount of sun peeking through(yes, winter is slowly starting to go,but then when was it ever here? 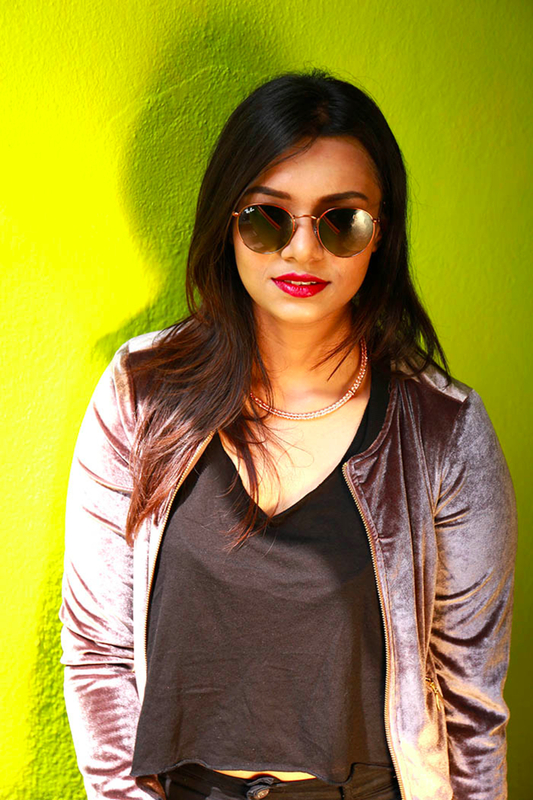 ).When I chanced upon this velvet bomber by vero moda,I knew I had to have it!! (I still hadn't purchased my first velvet bomber,I know,I'm like super late on this :P). For this outfit I wanted the bomber to be the showstopper like it rightfully is and hence kept the rest quite simple and pretty basic.I paired this with a cropped tank top in black and black denims.I added a bit of minimal glam by opting for a very basic metall neckpiece in rose gold and some sky high heels in beige with some laceup detail. Though the look may be quite simple, but it's perfect for a nice little night out with your friends when it's cold to wear a dress,besides, what's the point of wearing a dress if you're going to cover it up in some heavy layers?! Since I was wearing it out during the day I finished it off with a pair of nice raybans and a glossy berry lip! P.s The second part will be on a different velvet piece! !